House of Vintage and House of Sweets! 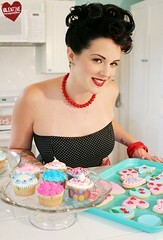 Even more House of Vintage cupcake pinup hotness! This just may be the coolest cupcake venture I've ever seen or heard about! In our shop is a vintage clothing shop & bakery. We also own Atomic Bettie Productions which transforms girls into pin-up.